3. How Does a Stock Market Crash Occur? The stock market crash of 1929, on a day that came to be called Black Tuesday, is one of the most famous events in the financial history of the United States and ultimately was a sign of the Great Depression to come. Like some subsequent crashes, the impact of the stock market crash is still felt in some financial reforms that were passed in its wake. The stock market crash and Great Depression are never far from economic leaders' minds in deciding what to do in more recent downturns. The U.S. stock market rose through much of the 1920s, though they began to decline in the last year of the decade. Then, on Oct. 24, 1929, the market began to fall rapidly. The selloff continued over the next few trading days, including days dubbed Black Monday and, most infamously, Black Tuesday on Oct. 29, 2019, when the market lost billions of dollars in market capitalization amid heavy trading volume. Many individuals and businesses had been heavily invested in the market, and some struggled to make basic purchases or pay employees after the market collapse. Some banks, which had invested consumer deposits in the soaring market, also were forced to shut their doors, costing some depositors their life savings. The market continued to decline over the next few years as the economy lurched into the Great Depression, with total market capitalization, or stock market value, in 1933 at less than 20 percent of where it was at its peak in 1929. Even people who weren't invested in the market were still affected by the Depression, which put millions of people out of work and led to the development of the New Deal under President Franklin Roosevelt, which changed the role of the government in society and the economy. Longer lasting effects of the stock market crash of 1929 include greater financial regulation and government oversight of the nation's economy. Unsurprisingly, the collapse of the stock market and its disastrous effects made consumers wary of the financial sector. At the time, the stock market was relatively unregulated, making it easy for fraudsters to scam investors with dodgy investment opportunities. 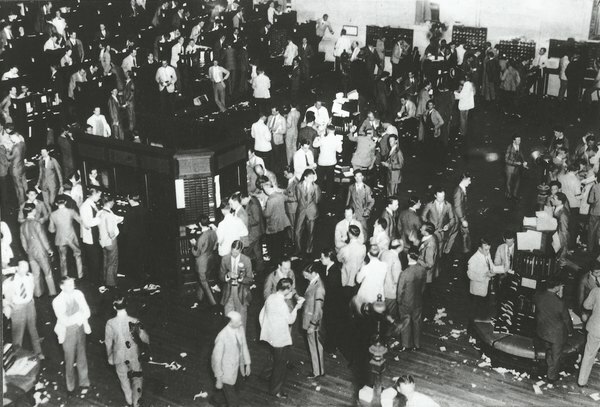 In the 1930s, under President Roosevelt, Congress passed a number of laws regulating stock market transactions, requiring publicly traded companies to regularly disclose information about their financial health and creating a new agency, the Securities and Exchange Commission, to regulate and supervise the industry. Companies that offer stock need to register with the SEC, as do brokers and dealers involved in helping consumers buy and sell it. The SEC has been involved in cracking down on fraudulent transactions, setting standards for information disclosure and working with federal prosecutors and law enforcement on issues of financial crime involving the stock market. Insider trading, where executives and others with private knowledge of company doings trade on it for profit, is also a frequent target of SEC enforcement. Another agency created in the wake of the stock market crash is the Federal Deposit Insurance Corporation. This agency insures deposits in banks, today up to $250,000 per account-holder and bank, and also has a role in regulating the financial institutions. It was created in 1934 in response to the bank failures after the crash and boasts no depositor has ever lost FDIC-insured funds. Typically when a bank is on the verge of failure, the FDIC will arrange for another institution to acquire its assets and accounts. Often there is no gap in which consumers are unable to access their funds, as the transitions are typically handled outside of banking hours. The FDIC doesn't insure non-bank products such as brokerage accounts. A comparable agency called the National Credit Union Administration insures and regulates credit unions, nonprofit groups that provide similar services to banks. Some states also have their own deposit insurance programs that can protect more depositor funds than FDIC insurance alone. After the Great Depression began, Roosevelt won the election amid criticism of President Herbert Hoover, who was felt to not be doing enough to fix the economy and put people back to work. Roosevelt and Congress soon instituted a number of programs that are collectively called the New Deal. Some of these programs, such as the Works Progress Administration that hired people to work on public works, as well as art, literature and theater programs, have since lapsed. Others, such as the Social Security system that provides benefits to disabled people, senior citizens, widows and orphans, continue to exist and remain popular with voters. Regulatory bodies, including the FDIC and SEC, also continue to play an important part in the nation's economy. The federal government expanded its role in regulating and backing mortgage loans to expand access to homeownership and to shaping the relationship between labor unions and employers with the new National Labor Relations Board, which still exists today, and the Fair Labor Standards Act, which ended most child labor and guaranteed a minimum wage. More fundamentally, the New Deal changed people's views of the government's relationship with society, making voters take for granted the idea of a social safety net and federal government regulation of economic activity. That paved the way for later innovations such as Medicare, the tax-funded health insurance program for elderly and disabled people, and the Consumer Financial Protection Bureau. It's difficult to discuss the stock market crash and the Great Depression without also discussing World War II. While the rise of fascism and Nazism in Europe had many causes, at least some of the motivation involved economic struggles in Germany, Spain and other countries around the world as part of the global depression. The war, enormously costly in both dollars and human life, also solidified the U.S. role as a major power in world affairs and ushered in the Cold War between the United States and the Soviet Union. Cold War aversion to Soviet-style communism helped continue to shape the U.S. economy and approach to regulation of industry for the next decades. Its effects on industry in areas where the war was actively fought also provided a boost to U.S. companies in industries like steel and automobiles, helping fuel the historic postwar economic boom in the United States. The 1929 crash and the Great Depression aren't the only economic crises to lead to changes in financial regulation. The savings and loan crisis in the 1980s, which caused the failure of about a third of the savings and loans – a type of bank– in the United States led to stricter rules for FDIC regulation. After the 2008 financial crisis, which was facilitated by banks issuing mortgages to people who couldn't afford to pay them and led to the collapse of Lehman Brothers, Bear Stearns, Washington Mutual and other well-known financial institutions, Congress passed the Dodd-Frank Act, increasing financial regulation and creating the Consumer Financial Protection Bureau to regulate financial institutions. Arguably, it was the precedent set by successful regulatory interventions after the 1929 Black Tuesday crash that led Congress and regulators to respond to subsequent economic issues with new rules. What Was Black Monday in the Stock Market? Does the Stock Market Affect the Housing Market?